Alex was my bud tender when I came in with my daughter. We were visiting relatives down in L.A. and are from Oregon. She was so friendly and helpful and got us just the medication we both needed to make our trip a fun and memorable one. Those Dompens were amazing! I didn't get the woman's name from that company who was there, selling them. But she was pretty chill, too. This place is a great place to go if you are coming into Burbank Airport and need some good stuff to get you through your trip. You'll be so glad you did. Thank you, Alex. The team here at Fountain of Wellbeing is thrilled to hear such positive feedback, and we're proud to be one of the most helpful and friendly dispensaries in Los Angeles! Thank you for taking time to leave a review, and mentioning our amazing budtender, Alex. We're so glad she took such great care of you and your family! We agree, Dompen is a superb brand and we're glad you enjoyed their quality products. We hope you visit us next time you're visiting from Oregon! Safe travels. Paul M. Was very helpful on my visit today. First time buying a vape pen. He was very informative. He also helped my girl get a lotion for her knee pain and recommended it the best ones. He answered our questions before we even asked them. Very educated on his stuff. Would come back just to buy from him. It's so great to hear that Paul anticipated your every need here at Fountain of Wellbeing! We are so lucky to have such educated and well-versed employees in the canna-business. It's important to get guidance you can trust, and you can always count on us! We look forward to your return! I really dig this place. The layout is clean, the displays are interesting and the staff is always super nice. From the security people all the way to the folks behind the counter. Special shoutout to Barbie! She's super knowledgable. You guys should name a strain after her! Thank you so much for your review! We really do have the best staff here at Fountain of Wellbeing that stays committed to expanding their cannabis knowledge and service. Thanks for the strain name advice, I agree! Great place, people, products, and price!..This is the only place I go. We are honored to be your go to shop! We appreciate your compliments. 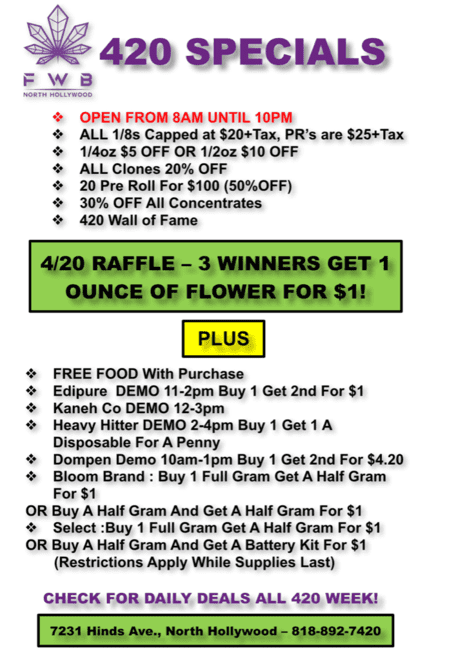 We hope to see you 4/20 for amazing deals for the first 200 patients!! Very well organized, Barbara was super helpful, have great recommendations. Will definitely be back. Hoping for higher CBD strains in the future, please. Best place to go to, everything is dank and at a reasonable price. Theyre staff is the best, i think the have a legitimite team of people. Definately recommend this place to everyone i know. Great with first timers too! We appreciate all the referrals! Here at FWB, we love growing the best herb in the 818!! Follow our cultivators @KNBISla to watch our beautiful girls grow. I absolutely love this collective! I moved into the area a little over a year ago and this has been the only collective in the area I have ever gone back to... and I go every time! I was a long term patient at the Kind Center for years prior due to location and although the selection may be slightly smaller at FWB what they lack in quantity they make up for in QUALITY! I have NEVER been disappointed by any strain, concentrate, edible, tincture or recommendation I’ve gotten. The staff is extremely knowledgeable, they cultivate on-site, their buds are organic & their overall care for you @ the product is much higher than most of the collectives I’ve been to. The product is lab tested and their expertise & attention to detail shows through in all ways. I highly recommend FWB to patients/consumers who want to KNOW what they are consuming and feel assured of its quality.